The Hope and Happiness Tour in the Last Shangri-La! A place dedicated to happiness. Prayer flags above the sacred Tatkshang Lhakang, Bhutan. One of the tiniest countries in the world but with one of the biggest hearts, Bhutan is set in the Himalayas with it’s dramatic landscapes of towering snow peaked mountains and deep, luscious valleys. 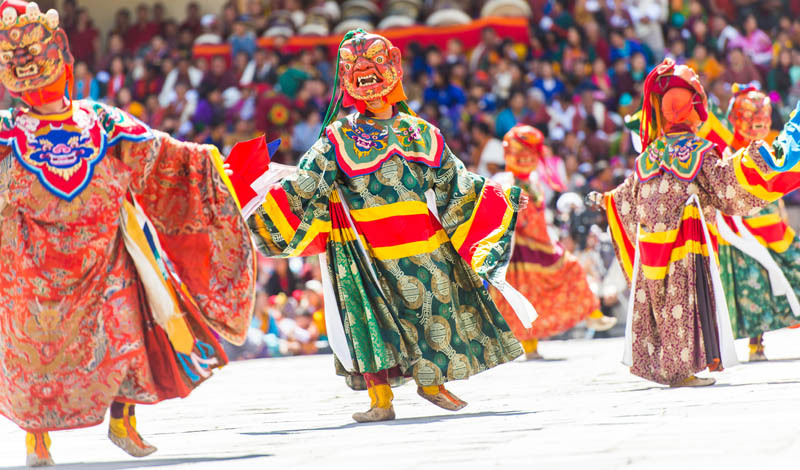 To maintain the overall happiness of their people the Bhutanese make their culture and environment top priority. 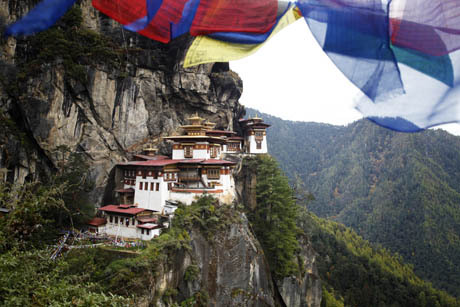 This means they encourage guests to the country to experience Bhutan as authentically as possible. While enjoying a couple of their fascinating festivals we’ll stay in family run farms and homes as well as sample some of the hotels and their range of spa treatments. Known for its wealth of medicinal herbs and hot mineral springs Bhutan offers you relaxation and healing for your mind, body and soul. Not to mention the opportunity to catch a glimpse of the rare snow leopard along with a heart thumping visit to Tigers Nest Monastery perched like an eyrie high up on the mountains edge. 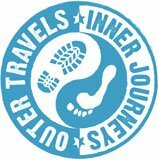 We are exploring the possibility of including in our tour a visit to the Jomolhari Mountain Festival, a two day event set among some of the most stunning Bhutan scenery and which is helping to support the conservation of the endangered snow leopard as well as local culture. This area is particularly valuable to snow leopards – they thrive here. The festival, initiated in 2013, includes snow leopard themed folk songs and dances performed by the local people and school children, traditional sports such as Khuru (darts), shot put, horse and yak riding, sampling of local delicacies and boutique handicrafts, and various picturesque guided hikes in and around Jomolhari. Bhutan is one of a kind. Not only has it completed the building of its first Happiness Centre, it could also be the worlds first wholly organic nation within the next ten years. The Happiness Centre, set in the exquisitely beautiful Bumthang Valley overlooked by the foothills of the Himalayas will officially open its doors on 18th October 2015. People from all over the world will be able to visit to learn the three basic principles for leading a happier life – to be part of nature, to serve others with kindness and compassion, and to discover their innate value. On the organic food front the government of Bhutan are extremely keen to eradicate all use of chemical pesticides and fertilisers. To explore other more nature friendly products Bhutan has engaged with experts from around the world. Some people don’t think it’s a really viable idea and that farmers are concerned about a drop in yield if they consistently turn their backs on the more modern approach but the government is optimistic about the potential. Fewer than a million inhabitants live in this country which is about the same size as Switzerland. Many of them live on unbelievably tiny amounts of money and yet happiness is a paramount focus. If some of their way of life and commitment to kindliness rubs off on us then life may never be the same again. We will be announcing dates for this tour later in 2017. To get on our announcement list please join our mailing list below.